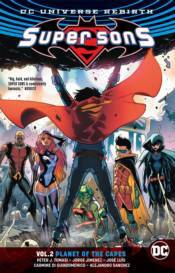 Robin has a new member in mind for the Teen Titans, and-spoiler alert-it's Superboy! But something sinister is at work, and Damian's real motives for introducing Jon to the team are revealed to devastating consequences! Monster-maker Kraklow puts Superboy to the test during his first team-up with Damian Wayne's Teen Titans. Collects SUPER SONS #6-10.